One of the great things about Muay Thai is that it requires very little equipment to be successful. All that you need to get started, after you buy a good pair of gloves and hand wraps, is a good pair of shin guards designed specifically for Muay Thai. Shin guards are pivotal to safe and effective training. They keep you safe when performing drills with training tools like heavy bags as well as when you’re sparring with a partner for practice. Beginners, in particular, benefit from shin guards since they don’t yet know how to control the power of their kicks. However, even more advanced users should still wear shin guards for training. Below we show you exactly how to buy the best Muay Thai shin guards to take your training to a whole new level. There are literally dozens upon dozens of different types of Muay Thai shin guards available. We’re here to tell you that they’re not all created equal. Some models are much better than others. What does better mean in this scenario? Well, in our opinion, the shin guards must not only fit well, but also provide ample protection without restricting your movement. 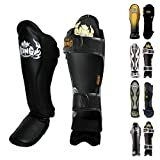 Start your search by looking only at shin guards designed for Muay Thai. Though it can be tempting to buy generic shin guards, it really is very important to buy those that are created with Muay Thai in mind. There are two main varieties of Muay Thai shin guards. These are shin guards with straps and shin guard socks. Shin guards with straps are most popular. The front part of the shin guard (the actual guard) is held to the leg by a series of straps. These shin guards provide ample protection all along the shin and down onto the top of the foot. They provide protection to both the person wearing them and the person they are sparring with. Because shin guards with straps provide the most protection (more than shin guard socks), they’re the most popular choice for wearing while training and sparring. Shin guard socks consist of a shin guard attached to a sock-like sleeve. Place your foot and shin down through the sleeve to attach them. This type of shin guard is much tighter than the strap version. They have minimal movement so you don’t have to adjust your shin guards often. Note that shin guard socks offer less protection than shin guards with straps. However, because of their lightweight, cozy fit, and comfort, they’re the most popular choice for wearing in fights. Selecting the right size of Muay Thai shin guards is very important. You want your shin guards to be large enough to provide ample protection. At the same time, they must be small enough not to affect your mobility. For instance, you might notice that overly large shin guards slow down your kicks. On the flip side, overly small shin guards will leave your shins and feet bruised and battered. The key is finding the perfect balance between mobility and protection. You’ll notice that size varies wildly depending upon manufacturer. Case in point: some shin guards are much narrower than others. Narrow shin guards offer much more mobility, but lack in protection. Because they don’t cover the sides of your shins and feet, they leave these areas open to damage. Our recommendation is to buy bigger shin guards as a beginner. Speed and mobility aren’t as important, but you want to make sure your shins and feet are protected at all costs. As you gain more experience, you can size down to smaller shin guards that promote lightning speed in favor of ample protection. The size of your shin guards mostly has to do with how much coverage and protection they offer. Fit, on the other hand, has to do with how well they fit you. It’s pivotal to find a pair that fits you properly for the utmost in comfort and performance. Properly fitting Muay Thai shin guards should fit tight. You don’t want them to move around during use. Properly fitting Muay Thai shin guards won’t need to be adjusted often. At the same time, you don’t want a pair that is so tight as to be uncomfortable. Overly tight shin guards can also cause mobility problems. If possible, try on Muay Thai shin guards before buying them. Fit varies from brand to brand and model to model, so trying on pairs in person is a good idea to see what you prefer. Here are our choices for 10 best Muay Thai shin guards for training, sparring, and fighting. Hayabusa is a well-respected name in fighting. They’re known for their top-quality MMA gear, including Muay Thai equipment. Their dedication to craftsmanship is apparent in their Hayabusa T3 Muay Thai Shin Guards. Developed from the ground up with Muay Thai in mind, these shin guards are ergonomically designed to fit to the legs and feet. Their specialized contours provide excellent comfort. The ergonomic design of these shin guards also improves their performance. They provide adequate coverage to protect your shins and legs while training and sparring. Other notable features are their impressive lightweight construction, open backs for improved circulation, and flexibility for even more comfort. We recommend the Hayabusa T3 Muay Thai Shin Guards for those looking for the best shin guards for training. Most companies focus on the comfort and safety of the person wearing the shin guards. Of course, Fairtex does that. But they also place emphasis on the comfort and safety of the person that you’re training or sparring with. That’s why the Fairtex Competition Muay Thai Shin Guards have been designed so that there are absolutely no rough edges or metal fixtures. They also feature a lightweight and comfortable design that doesn’t sacrifice mobility. Pair this with a lot of coverage and you have some of the best shin guards for Muay Thai around. The shin guards themselves are made from high-density foam. A synthetic leather shell covers them. This combination provides the utmost in shock-absorption. These Fairtex Competition Muay Thai Shin Guards are an excellent choice for those that are extremely aggressive in their training exercises and drills. Another great pair of shin guards with straps, the Top King Muay Thai Shin Guards are notable for their lightweight and mobility. These shin guards are perfect for those that don’t want to sacrifice mobility or agility during training exercises. They are created to be as unnoticeable as possible. Not only that, but they also provide great protection. Thick foam padding and a durable leather outer absorb heavy impacts with ease. These shin guards are available in four sizes to suit all different people. The shin guard section (not including feet) ranges from 15.5 inches long to 17.5 inches long. Yet perhaps the greatest feature of these shin guards is their durability. Top King is one of the best brands around. The durability of their shin guards attests to this. Premium leather construction is part of what helps the Venum Elite Standup Shin Guards stick out from the competition. The leather design not only means they’re some of the most durable shin guards around, but also improves their comfort (for both the user and the training partner). In addition to leather, these shin guards are constructed from high-density foam. It serves to further improve shock absorption. The increased protection is much appreciated during training. Velcro straps promote a no-slip fit. However, as a shin guard with straps, these will slip a little bit during use, no matter how tight you cinch them. 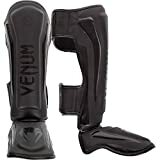 All in all, these Venum Elite Standup Shin Guards are a quality choice at a quality price. While the Hayabusa T3 Muay Thai Shin Guards are our top choice for training and sparring, the Combat Sports Muay Thai Shin Guards are our top choice for fighting. As shin guard socks, this model from Combat Sports comes with a sleeve. Place your feet and shins through the sleeves for the tightest fit possible. You don’t want your shin guards to slip during an intense fight – and these won’t. They’ll stay snug until the end of the round. There is no need for adjusting them while in use. Other highlights include the fact that they’re fully washable. Just remove the foam padding and throw the shin guard socks in with the rest of your load. These shin guard socks from Combat Sports are also extremely lightweight. You won’t even notice an impact on your mobility while fighting. 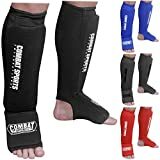 We recommend the Combat Sports Muay Thai Shin Guards for those looking for the best shin guards for fighting. Those that greatly value support and protection will love the RDX Leather Muay Thai Shin Guards. Seriously though, these shin guards provide the ultimate in protection. Their leather design means that they absorb heavy shocks like no other. The leather design also promotes durability. Even after years of heavy use and abuse, these shin guards will provide as much protection as the day you bought them. Despite being shin guards with straps, these shin guards from RDX have a very snug fit. You won’t find yourself adjusting them much at all during use. We’ll be honest: these shin guards are heavier and bulkier than some other models. But it’s barely enough to notice. Only the pickiest of users will find fault with these RDX shin guards for Muay Thai. 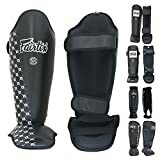 If you’re looking for shin guards that can be used in an amateur Muay Thai competition, the Fairtex SP3 Pro Style Shin Guards are a great choice. They are constructed with no metal loops or rough edges. This makes them eligible in all amateur competitions, including MMA. They utilize high impact foam with a leather outer for great performance. Hard blows are absorbed with ease. Another notable aspect of these Fairtex shin guards are their stitch-free design. The lack of interior stitches means increased comfort and no pressure from stitching pressing against your body. These are one of the best options for fighting at the amateur level. These Top King Muay Thai Shin Pads stick out from the pack thanks to their premium leather construction. Velcro straps hold the shin pads tight to your legs. The tightness isn’t restricting while still holding them tight enough not to slip. The wide design of these guards provides great protection. The maximum protection helps prevent injuries during training and sparring. These shin guards have a simple, minimalist design. They don’t have any bells or whistles. In our opinion, that’s partially what makes them so great. These are another fantastic option for those looking for Muay Thai shin guards specifically for training. Not everyone wants a super protective shin guard for Muay Thai. Some prefer something smaller and more lightweight. Those that value lightness above all else will love the ARD Muay Thai Shin Protectors. Even though they boast a minimalist design, they will still protect your shins and feet from bruising. The shin guards utilize thin high-density foam padding with an elastic cotton. This promotes lightness as well as comfort. Your mobility will not be sacrificed. We also love the fact that these shin guards are so cheap. That makes them very attractive to pure beginners to the sport who are not yet sure if they want to invest in Muay Thai. You’ll be seriously hard pressed to find a pair of Muay Thai shin guards anywhere near as light as these from Hypnotik. Constructed from high density foam and polyester fabric, the shin guard socks are incredibly lightweight to promote the utmost in mobility. Though they don’t provide as much protection as other models, they do provide enough protection for basic training exercises. They are also the perfect choice to wear in fights. We also like the fact that these Hypnotik Lightweight Shin Guards are so breathable. Unlike other models, your legs won’t become overly hot in the middle of a fight or intense training session. After you select the type of shin guards you prefer (straps or socks), the most important factor is the size and fit. Finding the right size and fit not only means the shin guards will be comfortable and provide adequate mobility, but it also means they will provide ample protection as well. But those are only a few of the factors in a good pair of shin guards. There are numerous other factors you should consider while making a decision. Chief among these are brand name, materials, and additional features. While you shouldn’t put too much emphasis on brand name, it should still be a factor in your decision. The fact is simple. Some companies simply provide a superior quality product than others. And it pays to select products from the top competitors, even if they cost more upfront. In addition to quality and durability, the shin guards from reputable manufacturers are more comfortable. The two main types of materials that Muay Thai shin guards are constructed from are leather and synthetic. Though both material types have their pros and cons, many seasoned Muay Thai enthusiasts prefer leather. Leather is the most comfortable and protective option. It also lasts longest. Many people argue that it looks better than synthetic. Synthetic, on the other hand, is much cheaper than leather. Recent advances mean its comparably comfortable and durable to leather. Another benefit of synthetic shin guards is that they come with many additional features that leather doesn’t. This includes anti-bacterial technology. Muay Thai shin guards have long followed the same basic design and construction elements. However, the latest models and designs now incorporate additional features that make the shin guards even better and higher performing. Chief among these are anti-bacterial shin guards. Made with synthetic materials, these shin guards reduce the risk of a bacterial infection. Another popular feature is breathability. The best synthetic shin guards are extremely breathable for better comfort and performance. Finally, quick adjusting straps are essential on shin guards with straps. Not only do they allow you to take the shin guards on and off quicker, but they also allow you to adjust and tighten them on the fly. A good pair of durable, high-quality shin guards is something many of those new to Muay Thai overlook. Yet good shin guards are just as important as good gloves and hand wraps. They protect your shins and feet from injuries while training. In fact, you should rarely train for Muay Thai without shin guards. They’re just as important for solo training with a heavy bag as they are for sparring with a partner. Many Muay Thai enthusiasts even use shin guards for fights. The exact type of shin guards that are best for you depend on your needs and preferences. It also depends on whether you will use them primarily for training or fighting. For training, our favorite option is the Hayabusa T3 Muay Thai Shin Guards. We like them because they fit to the contour of your legs, providing the utmost in support, performance, and comfort. For fighting, our favorite option is the Combat Sports Muay Thai Shin Guards. We like them because their low profile provides excellent mobility without sacrificing protection. Whether you choose one of these two models or another pair of shin guards on our list, we’re sure that our buyer’s guide will help you find the best Muay Thai shin guards for you.